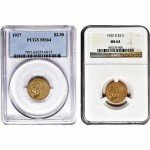 Customers: please take note that these coins will be certified by either PCGS OR NGC with a grade of MS62. 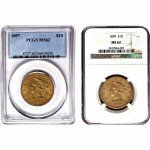 Coins will be from years of our choice ranging from 1908-1929. Coins will be picked based upon our current inventory selection. 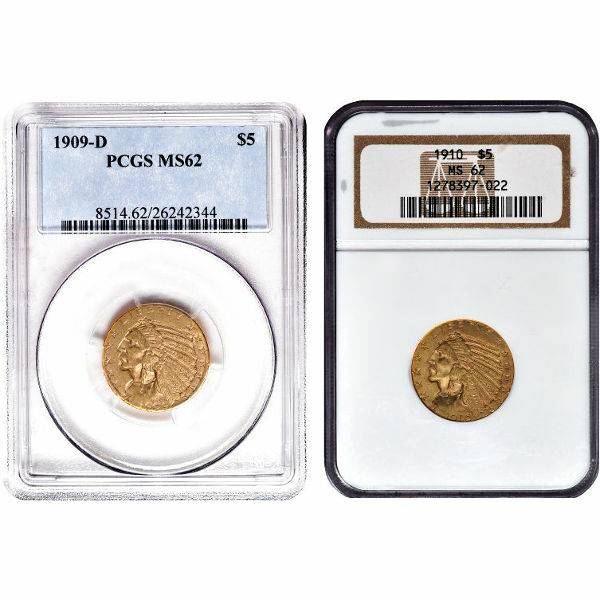 The $5 Indian Gold Half Eagle Coin was first produced by the US Mint in 1908. Its mintage continued until 1916, when production was suspended due to World War I. 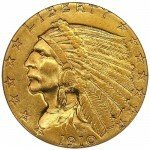 Although production for the $5 Indian Half Eagle would restart in 1929, it would only last for one year. Ultimately, it became the last $5 gold coin to be produced by the United States Mint prior to President Franklin Roosevelt’s discontinuation of gold currency in 1933. 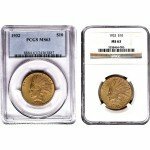 Every Indian Half Eagle coin featured in this collection has been verified with a gold content of .2419 troy ounces and an MS62 (Mint State 62) grade by either the NGC or the PCGS. MS62 graded coins are characterized by a worn, but acceptable appearance with only a few visible scuffs or hairline marks. In order to keep each coins condition in tact, these pieces have been kept sealed in their certified coin slabs. The most distinguishing trait of the $5 Indian Half Eagle coin is its recessed design. While most coins have raised or elevated images that are sculpted on top of their surfaces, coins with a recessed design have images that are carved into their surfaces. This coin along with the $2.5 Indian Quarter Eagle are the only pieces of US currency that have recessed designs. Serving as the primary focal point of the coin’s obverse is artist Bela Lyon Pratt’s rendition of a Native American man. He has portrayed the noble warrior in profile, wearing his traditional feathered headpiece. Encircling his profile is a series of thirteen stars to symbolize the original colonies. Also included in this border is the word “Liberty” and the coin’s mintage year appearing above and below the portrait respectively. On the reverse of the coin, Pratt provides his viewers with an image of our national bird; the bald eagle. It is depicted stoically perched on a bundle of arrows entwined with an olive branch. The phrase “E Pluribus Unum” appears to its left, while “In God We Trust” appears to the right. Along the top and bottom of the coin is our nation’s name along with the coin’s denomination. With its rich history and standout design, the $5 Indian Gold Half Eagle coin will make an impressive addition to any collection. For further information regarding these coins, please call us at 888-989-7223. Our staff is also happy to offer assistance through live chat or the online form located on our contact page.